The early moments of the latest “Hunger Games” picture are about nightmares: specifically, those that belong to Katniss Everdeen, who often stirs from slumber in violent fashion as if escaping the clutches of a brutal adversary. The camera does not show too many details of their content, and that’s remarkable given the nature of our cinema to reveal the most gruesome aspects of our imaginations; instead, the scenes are used to cast underlying vulnerability on a character that must become the face of an impending revolt, and her uncertainty drives the direction of a wide array of critical decisions leading up to an agenda that will (hopefully) overthrow a bunch of overdressed fascists from power. Our inability to observe the entirety of those dreams is irrelevant; because they are hers and hers alone, they add a touch of almost emotional mystery to the material. Indeed, what is left for her to fear, especially in a society content to sacrifice kids for the sake of entertainment? Is there really anything remaining that could compare to the tragedy of participating in not one but two battles to the death with a bunch of innocent peers? Hers is the trauma that often turns the youngest of minds into the most cynical, and if there is to be any relief at the end of this gloomy world of death and oppression, one hopes she is able to reconcile some of it before drowning in the inevitable depression that follows. If the first film in this series emphasized these horrific possibilities with a sense of masochistic glee (and not always in a rewarding way), then the follow-up – the much more tempered “Catching Fire” – brought them within a plausible context that roused our desires for some semblance of justice. Now comes “Mockingjay Part 1,” a more character driven vehicle in which the silent war between the “Capital” and its lowly districts of poor and dying masses reaches the peak of its possibility, and shows individuals come into that ever-so-critical phase of literary adolescence in which their decisions will carry that obligatory risk of affecting the lives of millions of hopeful onlookers. Harry Potter at least had the benefit of anticipation (and years of preparation) before matching wits with a deadly nemesis; here, Katniss and a select few survivors of the Hunger Games have arrived quite rapidly at the juncture at which their existence undermines the needed security of a fascist rule, and every step they take comes with a plethora of grave consequences. You will recall the climax of the last picture well. After Katniss effectively unraveled the 75th Hunger Games ceremony with a rather rebellious impulse, she was whisked away by a small group of individuals who had hidden agendas. Key among them: the game’s architect Plutarch Heavensbee (Philip Seymour Hoffman), who was playing double agent in order to get close to her as she made her second descent into the deadly games. What roused him to find her so important, so key as a component in his agenda? She was unlike any of the competitors that came before her; confident and driven by the nature of individual sacrifice, she quietly protested the actions of her government and then outsmarted them in a final stretch of competition that inspired an awakening of free will. 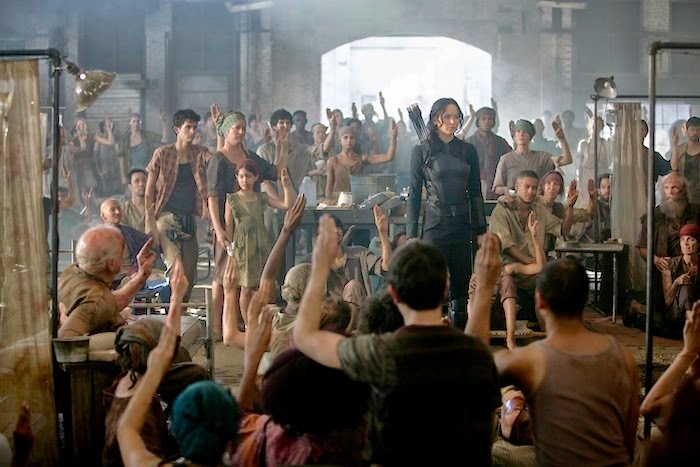 All 12 districts were put under harsh scrutiny after indications of uprising began to surface in the wake of her startling victory, and now comes news that District 13 – once mentioned in whispers as if long destroyed – has emerged at the forefront of events, ready to take the momentum that she started a year before and turn it into a full-on rebellion. Unlike the others, District 13 is a closed world of underground corridors that exists in utter defiance of the government. The head of the resistance is President Alma Coin (Julianne Moore), a sullen and deadpan leader who at first sees the arrival of Katniss from a place of pessimism; scarred by the games and distraught over the face that District 13 rescued her but not Peeta (Josh Hutcherson), she is not immediately driven by the instinct of audacious protest, as Coin was lead to believe. Then there are startling twists that stir Katniss to passion: the sight of her home – District 12 – completely evaporated and littered in bodies of innocent civilians, and the bombing of a hospital filled with thousands of injured fighters after she makes a surprise visit. These are catalysts that inspire all those obligatory monologues of profound announcements that are a staple of rebellious heroes, and both Coin and Heavensbee use those moments to fuel a propaganda campaign that spreads rapidly amongst the districts, with the moniker of a Mockingjay serving as the symbol of revolt. A revolution is brewing between these factions but the movie refuses to get too close to that prospect; such material is inevitably saved for the follow-up. Instead, “Mockingjay Part 1” spends nearly all of its time dealing with exposition: details on characters, their motives, what sorts of relationships they have and how we anticipate they may persist, and the political games between both sides that play out on TV broadcasts (some, I must warn, are vindictive and shocking). If not for the fact that “Catching Fire” supplied this premise with all the right philosophical notes needed to stoke our internal passions, than all of this might have seemed curiously out of step with the momentum of the plot. But the movie is fully engrossing with the morsels it does provide. Consider the intimacy of simple scenes like one when a crew of misfits assigned to watch over Katniss spend time at the edge of a river, and encourage her to sing to the sound of a Mockingjay whistle carrying over the hills – what other film of this vein (and there have been plenty) would have bothered taking the time to create such an organic moment, and use it to build underlying enthusiasm in what is to follow? What story this far into the chaos would bother raising up minor players – including her closest friend Gale (Liam Hemsworth) and her amusing but insightful companion Effie (Elizabeth Banks) – when it so clearly doesn’t need to? The screenplay by Peter Craig and Danny Strong cares almost as fully about its subjects as Suzanne Collins (the author of the novels) does. And it doesn’t rush any of their interactions at the beckoning of inevitable plot twists, either. The movie is slow, but strategically so, and once the momentum does begin to pick up it doesn’t lose them all in a haze of shoddy camerawork or hasty editing. My interest in this franchise was slower to the take than most, and I suspect that was because the initial premise didn’t offer much indication that any of the material was about more than just the stagnancy of its own concept, inevitably wrapped in an array of images meant to shock and dishearten without cohesive context (even though the images themselves were, admittedly, very well made). When the second movie revealed deeper intentions, I was won over by the story’s social intrigue and applauded the prowess of the screenplay, which used its closed world of imperialistic imbalance as a way to condition the nature of young adults into doing something out of step with their structure. This newest film (the first of two movies that cover the third book of this series) does not entirely balance those notions because it is all setup and exposition, existing for the sake of inspiring a two-hour climax expected to be released next spring. I don’t easily subscribe to the philosophy of splitting up a story arc in this fashion because it creates drastic imbalance. Think of the last two “Matrix” films, or “Harry Potter and the Deathly Hallows” (or worse yet, the last “Hobbit” picture). But if we are to take the material at face value, then “Mockingjay” accomplishes exactly what it needs to: it soaks the narrative in all the necessary suspense expected of a war that is quietly brewing between factions, and dabbles enough into the lives of its characters to create a sense of perspective (and offer meaning to what is to come). As far as detached setups go, this is a movie that effectively rouses our suspicions into something of dogged interest, and by the end we aren’t so much infuriated by the obligatory cliffhanger as we are eager to arrive at the end of this journey, if just for the sake of offering Katniss a much-needed opportunity to take a day off.